Yesterday Kirk and I got together and fished a few small streams. We had selected some of our favorites, and with the beautiful weather we were to have the anticipation was high. I won't go into detail about the day other than to say it was a best ten. The fish were there and they were hungry. I tied on one fly and stayed with it all day. Kirk after taking notice of the airborne insects went to the dry fly. There were a lot of these as well as caddis and stoneflies. What was to happen in this stream could not be even thought of happening. I cast the fly thorough the run several times and on one of those casts I felt a strike like I have never felt in a small stream. The line went tight and the 3wt bent like it never did before. I was at the beginning of an epic fight that took many long minutes to win. The brook trout made its weight felt when I began to get it close. That's when it ran, power like a steelhead. Kirk had been watching and made a comment.."your going to need a net", and neither one of us had one. Kirk said I have one in the truck and ran through the woods to his truck to get it. While this was taking place I still had a big angry brook trout to deal with and it showed no signs of giving up. Finally the brook trout came in, and Kirk put the net underwater and lifted the fish up. It was an awesome fish. This beautiful lady had been in this brook for sometime, seeing years of hardship and plenty and survived. That is a size 14 dry fly in the corner of her mouth. She was released to the waters she is familiar with and disappeared in seconds. That was the biggest brook trout from a Connecticut small stream I have ever caught. This is the fly, it will be retired. While this stream has no name, finding this on the bottom I decided to name the stream "Pick Ax Creek"
Congratulations Alan! That is an unbelievable fish! Rowan it's tops on my list. Congrats Al!!! That is an awesome brook trout!! WOW!!!! That is one big brook trout for our small New England freestone streams! A fish like that must have made that little 3wt Cabela's glass rod feel like a noodle! Mark a true story of survival. That rod earned a special place. Very capable. Ben like we were talking about last week....you never know. Nice!!! First Kirk now you, 2016 is going to be remembered as the Year of the Big Brrook Trout for the New Year's Day Crew! John that fish has some meaning...I'll let Kirk tell the story if he wants. Is that one of your bombers? Big shoulders on that brute. Peter the fly is a "Mini-Stimi"
Congrats!!! I tip my hat to your sir....I still can't believe my eyes that a brookie that big and nice would be found in such a "thin blue line". That one would be hard to ever top. Chris fish as those are rare, but is more so is the fact that it was caught two other times, and in the same pool. WOW! That is a HUGE fish for a small stream! Congrats! Will seems like it couldn't fit..it's in great shape also. one word sum's it up. WOW!!!! I just reward for years of dedicated fishing. A reward that will be hard to duplicate. What a wonderful gift Pick Ax Creek gave you! John yes it did. Like the name Pick Ax Creek? What a fish and to catch it on a dry fly is just icing. Kevin a sweet icing for sure. Beautiful fish! Thanks for sharing! So glad she was hooked by a responsible and caring angler! Adam 2 responsible and caring anglers....at different times. Beautiful fish. Is amazing that stream has fish of that size, congratulations. Mario we were all say the same thing....good food, great water, and a place to hide. Bill I don't think I have but Kirk has. I like that image too. That sure was a beauty Alan. I've never seen one quite that size out here. Good for you! Howard the only place I've encountered fish that size in a small stream is Maine. Armando most of the thanks go's to the stream. There must be some great food in it. Congrats , Alan I know the memory of that fish will never leave your mind but that photo needs to be on a wall somewhere near your fly tying table. I decided a long time ago that know matter how big a brook trout I catch it will always be released and a picture will be hung instead of a mounted fish. I can set in my tying room and see every photo of wonderful specimens that I have released along with retired flies , it brings me back to those expierences. I am glad that a great fish was caught by such a dedicated angler. Brad I'm going to do just that...photo, fly and a brief few words. Fantastic Fish! Pick Ax Creek yields a monster. Mike Pick Ax Creek needs more exploration. Hopefully there are some friendly landowners. That's one heck of a fish Alan. Catching one like that not only makes your day but makes you feel really good about the health of your fishery as well. Jeff seeing a fish like that is gratifying for the reason you stated. Simply put: WOW. And I love the name Pick Ax Creek. That find is a cherry on top of your PB brookie. Kierran great name indeed. Hard to find it on the map is another plus. I'll take a little differnt angle on those photos. First, I agree that one of them needs to be framed and hung. Two, the light that you captured that is was wonderful! The shade of the water and the sheen of the sun with the fish in the net is just gorgeous. Congrats on both accomplishments! Chris that photo you speak of is a highlight of small stream angling. To see water that pristine is a trophy in itself. Congratulations on that wonderful fish. I always appreciate the way you keep the fish in some water or a wet hand/net. Too many people posting pictures would lay that magnificent fish on the ground next to a rod. You handled her with the kind of respect that survivor deserved. Thank you. Chuck, that lady deserved the best, for what she has endured in her years respect is paramount. Beautiful fish! A perfect memory to hold on to for sure. Love the Pick Axe. That is a wallhanger for sure. Ralph she is in a special place on the wall...in photo that is. The pick would look good on an old barn wall. Wow!!! 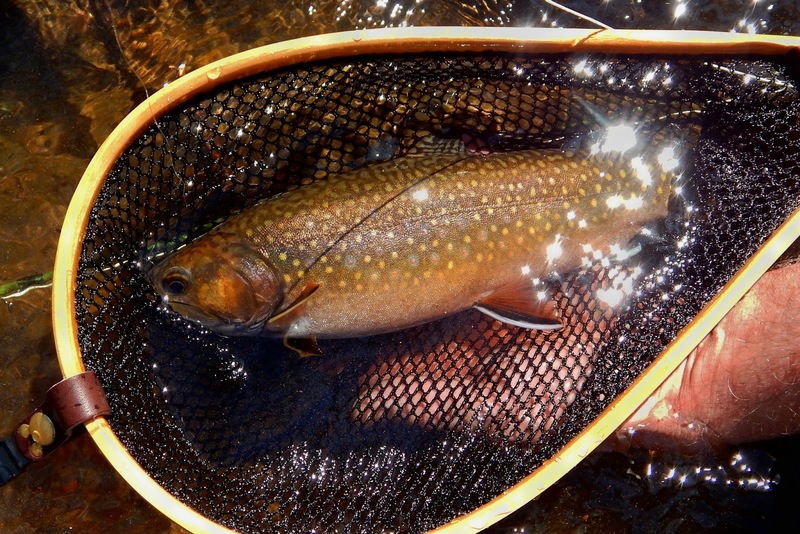 What a spectacular specimen for anywhere in Brook trout's range but especially for anywhere south of Maine. Great story, fish, and interesting find! That is a seriously beautiful brook trout! Having now seen one in person, I can attest to their beauty, and can only image what one with size would hold. Great stuff, Alan! Justin true beauty indeed. Fish that size are not common in such small waters. Glad I happened on her.